For similarly named works, see Alchemist (disambiguation). Early into his journey, he meets an old king named Melchizedek, or the king of Salem, who tells him to sell his sheep, so as to travel to Egypt, and introduces the idea of a Personal Legend. Your Personal Legend "is what you have always wanted to accomplish. Everyone, when they are young, knows what their Personal Legend is." Early in his arrival to Africa, a man who claims to be able to take Santiago to the pyramids instead robs him of what money he had made from selling his sheep. Santiago then embarks on a long path of working for a crystal merchant so as to make enough money to fulfill his personal legend and go to the pyramids. Along the way, the boy meets an Englishman who has come in search of an alchemist and continues his travels in his new companion's company. When they reach an oasis, Santiago meets and falls in love with an Arabian girl named Fatima, to whom he proposes marriage. She promises to do so only after he completes his journey. Frustrated at first, he later learns that true love will not stop nor must one sacrifice to it one's personal destiny, since to do so robs it of truth. The boy then encounters a wise alchemist who also teaches him to realize his true self. Together, they risk a journey through the territory of warring tribes, where the boy is forced to demonstrate his oneness with "the soul of the world" by turning himself into a simoom before he is allowed to proceed. Coelho wrote The Alchemist in only two weeks in 1987. He explained that he was able to write at this pace because the story was "already written in [his] soul." The book's main theme is about finding one's destiny, although according to The New York Times, The Alchemist is "more self-help than literature". The advice given Santiago that "when you really want something to happen, the whole universe will conspire so that your wish comes true" is the core of the novel's philosophy and a motif that plays throughout it. The Alchemist was first released by an obscure Brazilian publishing house. 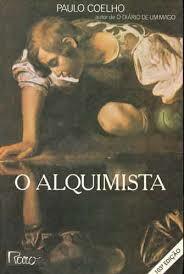 Albeit having sold "well", the publisher after a year decided to give Coelho back the rights. Needing to "heal" himself from this setback, Coelho set out to leave Rio de Janeiro with his wife and spent 40 days in the Mojave Desert. Returning from the excursion, Coelho decided he had to keep on struggling and was "so convinced it was a great book that [he] started knocking on doors". Coelho said that he has been reluctant to sell rights to his books. He believed that a book has a "life of its own inside the reader's mind", and seldom did he find an adaptation that lived up to the book. Despite this, with time, Coelho decided to open up the possibility. In 2003, Warner Bros. bought the rights to the film adaptation of The Alchemist. The project stalled and the movie never materialized, reportedly because of problems with the script. At one point, the script had a battle sequence with 10,000 soldiers, which was "not what the book is about." Reportedly, Coelho offered US$2 million to Warner Bros. to buy back the film rights to The Alchemist. During the 2008 Cannes Film Festival, Harvey Weinstein announced that he had bought the rights to the film and would serve as its producer. Laurence Fishburne is set to direct, and to play the eponymous character. It will have a reported budget of $60 million. Weinstein, who rarely personally produced movies, stated that "My loyalty is not to Laurence [Fishburne], my loyalty is not to me, my loyalty is not to anyone other than Paulo Coelho." Coelho added, "I am very happy that my book will be filmed in the way we intended it to be and I hope the spirit and simplicity of my work will be preserved. I am excited my friend Laurence Fishburne and Harvey Weinstein will be working together." In June 2015, it was reported that Idris Elba was set to play the protagonist and that Fishburne would direct the movie instead. HarperOne, a HarperCollins imprint, produced an illustrated version of the novel, with paintings by the French artist Mœbius, but failed to convince Coelho "to consent to the full graphic-novel treatment." In June 2010, HarperOne announced that it would publish a graphic-novel adaptation. The Alchemist: A Graphic Novel was published in 2010, adapted by Derek Ruiz and with artwork by Daniel Sampere. A theatrical adaptation of The Alchemist was produced and performed by the Cornish Collective, which is their most successful production to date. It was staged for the first time in India by Ashvin Gidwani Productions. Kajol and Karan Johar launched this book's theatrical adaptation in India. In music, The Alchemist has inspired numerous bands of the same name. In 1997 the classical label RCA Red Seal released The Alchemist's Symphony by composer and conductor Walter Taieb with the support of Paulo Coelho who wrote an original text for the CD booklet. In September 2009, an orchestral performance was conducted at the Ansche Chesed Synagogue on the Upper West Side. Inspired by The Alchemist, "an orchestral performance" was composed by One World Symphony for composer and conductor Sung Jin Hong's wedding. ^ "Paulo Coelho in WorldCat database". WorldCat. Retrieved December 20, 2016. ^ "The Alchemist > Editions". Goodreads. Retrieved December 20, 2016. ^ a b Pool, Hannah (March 19, 2009). "Question time". The Guardian. Retrieved January 27, 2012. ^ Cowles, Gregory (October 8, 2009). "Inside the List". The New York Times. Retrieved January 28, 2012. ^ Flanagan, Mark. "The Alchemist". ^ a b c "Interview with Paulo Coelho". Goodreads.com. March 2008. Retrieved January 27, 2012. ^ Fishburne to direct The Alchemist The Guardian. June 27, 2007. ^ Doland, Angela 'The Alchemist' to be made into movie USA Today. May 18, 2008. ^ "Paulo Coelho". The Guardian. July 22, 2008. Retrieved January 28, 2012. ^ Weinstein to produce 'Alchemist' film adaptation Muzi.com News. May 18, 2008. ^ The Weinstein Company to Bring 'The Alchemist' to the Big Screen Archived November 8, 2017, at the Wayback Machine Zoom In Online: Film & TV. ^ "Idris Elba set for Laurence Fishburne's film of Paulo Coelho's The Alchemist". The Guardian. June 5, 2015. Retrieved September 30, 2015. ^ a b Itzkoff, David (July 6, 2010). "Graphic Novel of 'The Alchemist': Words Into Pictures". The New York Times. Retrieved January 29, 2012. ^ The Cornish Theatre Collective Archived August 22, 2007, at the Wayback Machine The Alchemist. ^ "The week gone by... (11 Images)". Movies.ndtv.com. Archived from the original on July 11, 2012. Retrieved January 20, 2012. ^ "How The Alchemist came alive on theatre". rediff.com. Retrieved January 20, 2012. ^ "The week gone by... (11 Images)". Movies.ndtv.com. Retrieved January 20, 2012. ^ "Kajol and Karan at the launch of The Alchemist". Nowrunning.com. July 14, 2008. Retrieved January 20, 2012. ^ Walter Taieb (February 1, 2017). "The Alchemist's Symphony". Retrieved December 12, 2017 – via YouTube. ^ Schweitzer, Vivien (September 15, 2009). "Inspiration From Bjork, 'The Alchemist' and the Sea". The New York Times. Retrieved January 30, 2012.